"In historical publications, the Center House was listed as the site of the John Poole homestead, and also as the home site of Capt. Thomas Greene (the old miller) built before 1700. 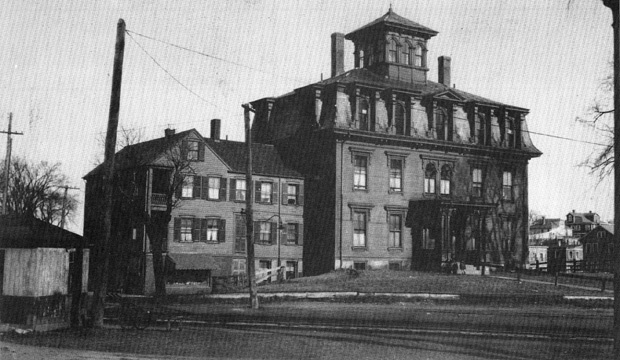 The Center House was named for its proximity to the Center Depot, and it may have been referred to as the Wakefield Boarding House. Several Wakefieldians remember a store and a tavern located on the first floor with apartments located above. Still others remember that it was used at some time as a hotel for travelers on the Danvers and South Reading Branch of Salem Railroad which was abandoned in 1926." -- Text from calendar by Jayne M. D'Onofrio. “Center House, Water Street, east of the railroad crossing, Winter, 1931,” NOBLE Digital Heritage, accessed April 22, 2019, https://digitalheritage.noblenet.org/noble/items/show/6894.